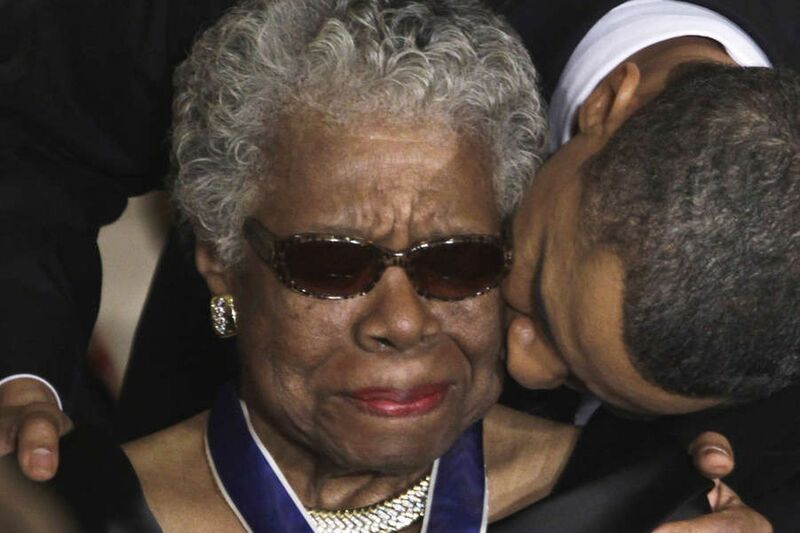 Former President Barack Obama kisses the late Maya Angelou after awarding her the 2010 Medal of Freedom at the White House. Growing up, I wouldn’t have dared address an older person using his or her first name. Social mores change. These days, it’s common for students to call their professors or teachers by their first names. We think of flip-flops as appropriate footwear for practically any occasion, even church. We will call a CEO “Bob” if that’s what his name is. The correct way of addressing someone, particularly an elder, is an old conundrum and a debate that resurfaced recently after a 1989 video of Maya Angelou began circulating on social media earlier this month. On the short clip from the TV show People Are Talking, a teenage girl poses a question to the noted poet and author about interracial marriage and makes the mistake of addressing her by her first name. Anyone else would have let it go. Not Ms. Angelou. The effect was the same. Later in the show, Angelou apologizes for being “short” with the questioner, Kim Watts. By the time of her death in 2014 at the age of 86, fans had begun referring to her as “Dr.” Angelou because of the numerous honorary doctorates she had received. But judging from the considerable positive reaction to Angelou’s dramatic response, that clip resonated with a lot of people. Many of us women still prefer being called Mrs. or Ms. when being addressed by considerably younger people. Some parents go so far as to name their sons “Mister” or “Sir” to make sure that’s what they get called. The desire for respect runs deep. I hate being a stickler, but your teenage kids don’t get to call me Jenice.